Build a wireless camera system in the area without electricity. - A blog about IP video security solution. A blog about IP video security solution. JOE ZHANG PRODUCT MANAGER Build a wireless camera system in the area without electricity. Image you can have your camera system working in an open area for 24/7, even the electricity is unavailable. How wonderful. 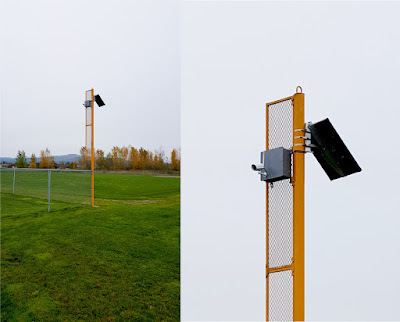 Automation Northwest, the system integration provider in the city of Orting, Washington, just installed a camera system to take motion snapshots of a base ball field parking lot recently. "There is no electricity at the field and so at night there is unwanted activity at the parking lot" Guy mentioned, "we use 55 watt solar panel, 12 volt 27AH battery and charge controller in the box. This System is designed for 7 days of operation with no solar light. This is for winter conditions where snow could blanket the panel for days." The camera is connected to the wireless router in the vehicle. "A later plan is to install a router at a nearby high school with a Yagi antenna and since it is line of sight should work" Guy said. The 32G SD card on-board storage eliminates the network video recorder (NVR) which should have connected with the camera. Guy also enabled the function of motion detection. The camera only takes snapshot when it detects the moving object from the image. It gives the camera 40% extra storage, keeping about one week snapshot. Of course, customer doesn't need to take off the SD card to browse the snapshot. His mobile phone, tablet, PC, all can become a monitor to view the camera. The customer can even check the real time snapshot or video when he is traveling outside of the USA. This camera system is not a giant deployment; however, it provides critical footage to the customer when he needs it, and working 24/7 on the field without electricity. Great job, Guy!